What causes this roughness on the citrus skin? What made these holes in my citrus fruit? The culprit has been identified and caught in the act! The Purple Grackle. 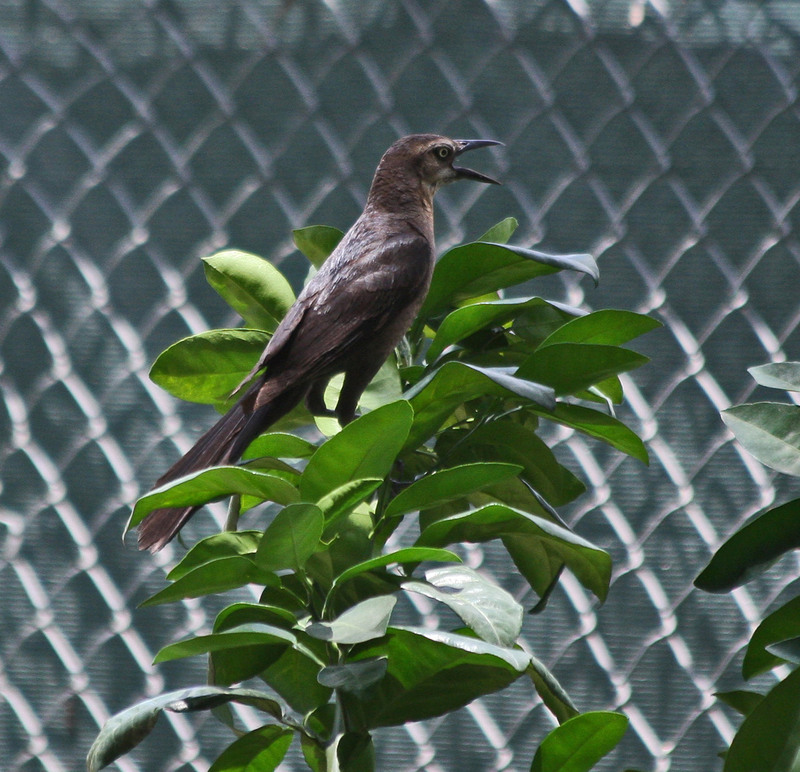 The female Grackle calls to others that citrus fruit has been found. The female Grackle then begins to peck the immature fruit. The female Grackle keeps watch while the male pecks the ping pong ball-size fruit (left side of plant). Recent fruit damage (right) with lesser damage (left) on the more difficult to reach (by the Grackle) fruit. Recent Grackle damage on left with more severe, earlier-inflicted damage on the cluster of three fruit on the right. 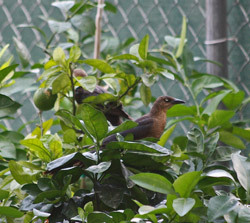 A severely, earlier-damaged fruit (bottom center) has been revisited and deeply penetrated by the Purple Grackles. Answer: Don't you just love it when someone claims everything was OK until "last week" or whenever? In this case, they are partly right. If you look at the first image("a"), you will note that the leaves around the fruit are fairly tattered--the damage to the fruit and the leaves are both classic examples of damage caused by strong winds repeatedly blowing them against adjacent thorns. That some of the fruit scar/punctures are darker indicates that not all of it occurred yesterday--though the majority may have been caused during the recent storms. 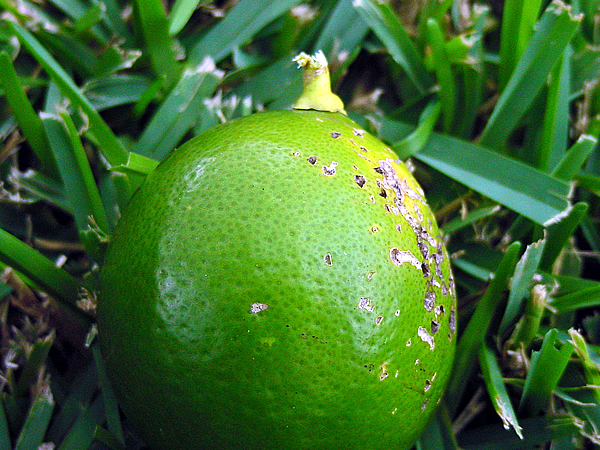 Image "b" shows some leaf tattering, while the deep gouges in the fruit look very much like bird damage (grackles do it in South Texas). 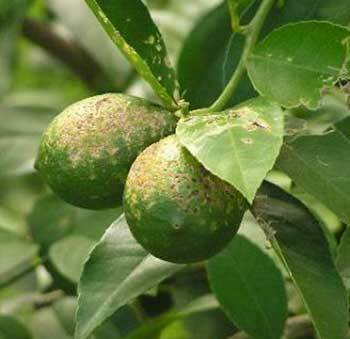 However, the condition of the exposed tissue and its color, plus the surrounding puncture marks on the fruit, confirm a very bad case of thorn puncture. I expect that if you were at the tree and could find these particular fruit, you would see a couple of pretty hefty thorns within just an inch or so. The answer to the expected followup question is that all of the fruit that persists on the tree will be edible, even if badly scarred. Those fruit in which the damage penetrates to the juice vesicles quickly are attacked by fungi and insects, so they rot and drop fairly soon after the damage occurs. QUESTION #1: What is caused the damage on this lemon fruit? 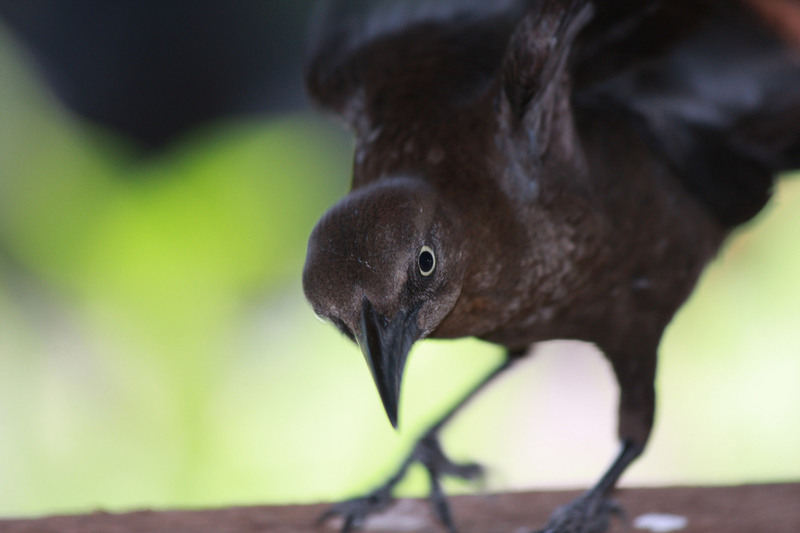 ANSWER #1: The major damage is from birds, most likely the grackle. 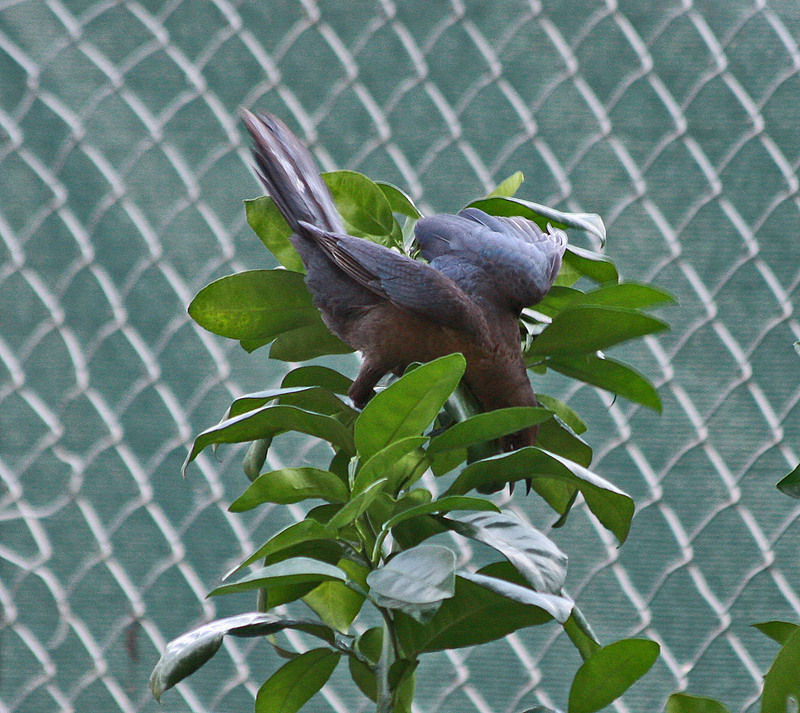 Because they often nest in citrus trees, the fledglings get kind of bored (since, by definition, they cannot fly yet) and they take it out on citrus fruits. The grackle damages are the ones that are almost black in color--and occurred back in late spring, most commonly in May. The lighter tan coloration denotes damage that may be a bit more recent in origin. If you look at those carefully, you will note that they consist of two indentations connected by a trough. 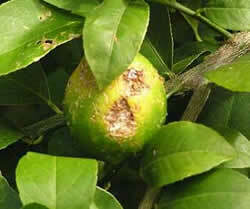 This is classical bagworm (you know those) damage to the rind of citrus. And don't ask me which hole he ate first, though my Scientific Wild A__ Guess is probably the smaller one, since the beast grew somewhat while on the fruit. 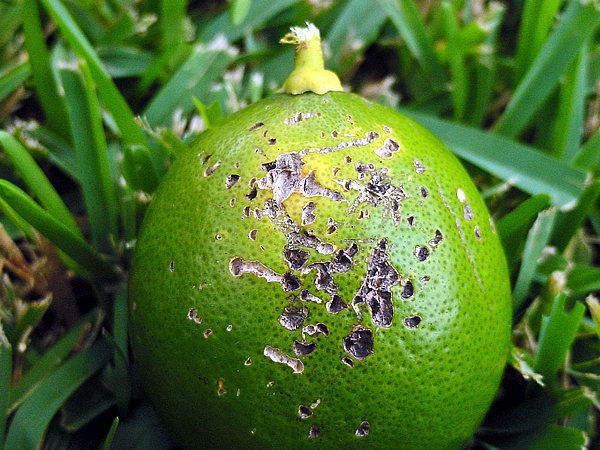 QUESTION #2: I have seen this damage on Satsumas as well--since Satsumas are thornless, how can this be thorn damage? Also, if this is grackle damage, why are the holes so shallow? 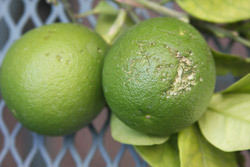 ANSWER #2: First, there is no truly thornless citrus, though some come close. The reason thorn damage is usually limited to one side of the fruit is because the offending thorn is on a twig on that side of the fruit--the pendulum effect of a fruit swinging in the wind is self evident. In the case of grackles, often there is only a limited area that is accessible to them because of other fruit, twigs, leaves et cetera. Depth of grackle punctures is quite shallow--bear in mind that at the time the fledglings are doing their mischief, the albedo is probably an inch or so thick, so the fruit is rather hard and difficult for such a bird to penetrate--they are not woodpeckers, you know. QUESTION #3: Is the only solution to net the trees shortly after bloom and keep it on until fruit ripening OR can you leave the netting on until the fruit gets golf-ball size?!?!? ANSWER #3: Personally, I wouldn't worry about it unless you are trying for show quality fruit--which ain't likely. Besides, netting probably won't preclude the bagworms. 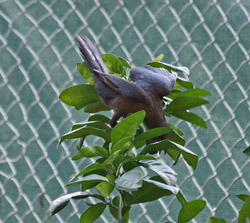 Generally, the netting would have to be in place during the critical time that grackles are nesting until the babies have fledged and flown away. Even then, it ain't all the fledglings, as the adult birds have also been known to cause the damage. If you had to guess--try immediately post-bloom and go into July and you probably won't have the damage. QUESTION #4: Malcolm Beck has been told this damage is caused by mites on the small fruit. 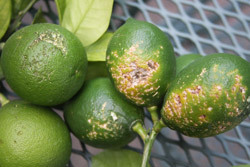 The damage is on the sunny side of the fruit where mites might congregate and could be controlled with a weekly Neem Oil spray beginning at fruit set. ANSWER #4: Now, let's quash the rumors from the Beck camp. First, mites as a rule absolutely shun direct sunlight, so there is no issue of their warmth causing them to congregate in a very small area on the sunny side of a fruit. 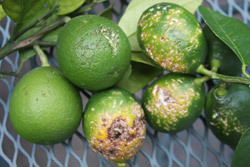 http://aggie-horticulture.tamu.edu/citrus/diagnostics/blemishes/blemishes.htm shows two rather distinct examples--top row, second image from the left (the fruit is upside down) shows sharkskin damage from mites (but notice there is no damage at the right--where the fruit was exposed to the sun), while the first image, second row shows severe russeting from citrus rust mites--the non-russetted portion of these fruit was exposed to the sun. Aside from that, mites are incapable of making that kind of hole--regardless of how small the fruit. A weekly oil spray? Give me a break! Aside from the exorbitant cost of such action, too many people have a hard enough time getting the grass cut every week. If true, I would suppose that the oil, the spraying or both disrupts the nesting of grackles, so no fledglings occur in the tree, thus no damage occurs. Even so, when does fruit development end--assuming it begins with the opening of the flower bud (which it doesn't)? I mean, how many sprayings is that, anyway? FORGET IT!! !